Michael Ward's Planet Narnia is now available in paperback. According to Michael: "Much cheaper than the hardback and containing a new preface and a number of corrections and improvements" - it's available from Amazon. 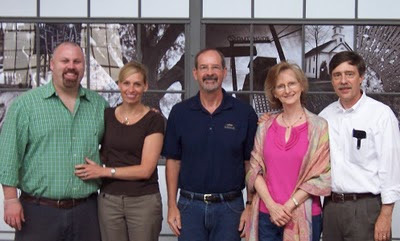 Pictured are, from the left, Chris Sorenson, pastor and administrator of the Camp House with his wife, Angie, Dr. Don King, Sheila and David Beckmann, Moderator of the Society. We were so pleased to have Dr. Don King of Montreat College. speak to us at our May meeting. Dr. King is an expert on C. S. Lewis' poetry and has just finished a book on the letters of Lewis' wife, Joy Davidman Lewis. 10:15 to 10:30 - question and answer. 10:30 - Break, Coffee, etc. Dr. King expanded our appreciation of Lewis by getting us into his poetry, which is something hardly any of us had ever done. The result for the attendees was, I think I can safely say, that we are all fans of Lewis' poetry now. Lewis' early poetry adds the emotional element to his younger years that is missing in Surprised by Joy. You can feel the intensity of his pain and resentment toward God. His later poetry is a door into the same or similar worlds we love in Narnia and his other fiction. They give you a chance to experience the same wonder of the books in a different context, a different setting. His poetry is also a way to study Lewis' personal life. King gave us a helpful chronology (with bibliography) of Lewis' poetry. I saved a few copies, so if you want one, let me know. Dr. King also pointed out a lesson of Christian discipleship from Lewis' dream of being a successful poet. He had to die to that dream so that the Lord might use his imaginative poetic powers for his kingdom; that Lewis might write monumental prose of poetic beauty. After having Dr. King with us, I think we will regularly refer to Lewis' poetry in our future meetings as a way of becoming more familiar with him, and of enjoying in bite-size fashion his wonderful imagination. Many thanks to Aaron for the coffee, to Adam & Dr. Higgins for the delicious goodies, and to the rest of the Camp House crew for reserving their facility for us this past Saturday morning. By the way, their new coffee bar is great and we look forward to having it available to us for the Friday night meetings we will resume in September.